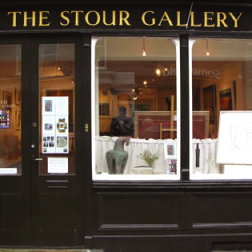 The Stour Gallery is a three-story building of cool white spaces and garden for showing contemporary art in the Warwickshire market town of Shipston-on-Stour, situated on the Oxfordshire, Gloucestershire, and Warwickshire borders. Successfully showing the work of painters, printmakers, sculptors, potters and jewellers with established reputations alongside emerging artists, with equal commitment to both. There is a particular emphasis on Cornish and West Country work, especially from the Penwith and Newlyn Societies, and increasingly fine and applied art from Ireland. Established in 1997 the gallery's continued and growing success is due high standard, originality and coherence of the work it shows, and its friendliness. A series of changing exhibitions and work by gallery artists always being available – ensures that visits will be rewardingly varied. You are welcome to visit simply to enjoy the work. We operate an interest free purchase scheme. Please contact us to go onto our mailing list – exclusive gallery use.